Mount Kilimanjaro Tanzania - American300 returns to Africa, this month on a mission of personal growth and exploration. After 12 years of supplying mentors to military members stationed around the world, the nonprofit has started a program to enhance the personal growth from within it’s own ranks. As word spread of Benjamin’s achievements, fellow mentor and purple heart recipients Marlene Rodriguez and AJ Hunter, expressed interest in pushing their limits in the mountains as well. In the case of AJ it was a matter of providing opportunity, Hunter has become a successful mountaineer and guide since being medically discharged. "Marlene, is a different story, she has zero high altitude climbing experience like so many wounded warriors from Texas," laughs fellow mentor Benjamin Breckheimer, adding, "But she's got the fire burning within and we have an amazing team of mentors who are renowned Everest climbers, so with time we'll get her trained up and on the big big mountain." This week, a team of mentors returns to Tanzania, to ascend the mountain via a new route that hopefully will prove to be the nonprofit's primary 'mentors in the mountains' route. "It's so important that a person's first experience in big mountain climbing is an excellent one," say Chris Klinke, one of American300's Purple Heart Summits team leaders, adding, "Last year we utilized a different route that was solid, but not exactly perfect for a rank beginner - our hope is that the team headed over this week will provided us with feedback that we can use to determine our best plan moving forward with Marlene's climb this summer." The new route will provide over a week of time on the mountain. The reason is two-fold says Klinke, “Acclimatization is a major issue, Kilimanjaro offers more vertical feet of climbing then Mt Everest - altitude sickness is real and can kill, but our program is also about bonding, having time to share and grow stronger together as a team." 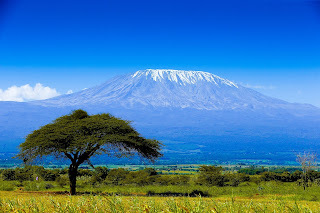 Kilimanjaro is a baby step from where AJ and Marlene really want to go which 8 thousand meter peaks like Mount Everest. If they continues to progress in training American300's goal is tomsupport them. I like it your rainbow travel mountain tour and holiday post.really very interesting and useful information.thanks for share this post.we provide machu picchu travel tour packages in low cost.please have a look over here.